From the moment you pop the question, make sure your sweetheart has a ring that she can proudly show off to family and friends on the engagement day and every day thereafter. The double prong setting of this dazzling diamond ring gives it irresistible allure, making it even more special. What a beautiful and unique ring to symbolize your undying love. You are about to ask the love of your life for her hand. 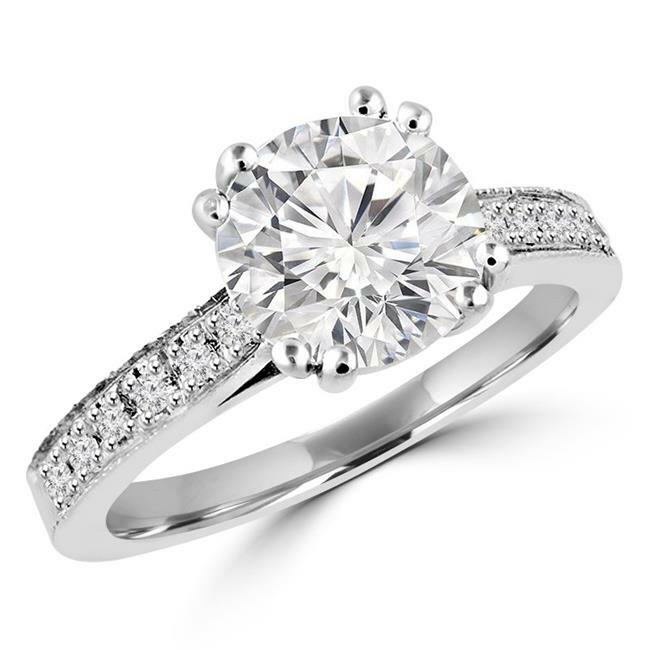 Let this timeless ring speak volumes about your love for her. It's the right choice. Express your devotion with this gorgeous 0.61 CTW Round Diamond Double Prong Engagement Ring. The mesmerizing 0.47 CT round cut diamond centerpiece has an F-G color range and VS2-SI1 clarity. Twelve lovely 0.14 CTW accent diamonds shine along the shank with an F-G color range and VS1-VS2 clarity. This is a ring she'll treasure always.